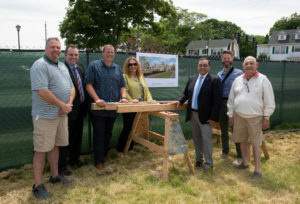 MCHENRY, IL – On Friday, June 8th, HUD Region V Administrator Joseph Galvan, representatives of Congressman Randy Hultgren’s office, Illinois State Senator Pamela Althoff and McHenry Mayor Wayne Jett joined Full Circle Communities and financial, service, and community partners to celebrate the commencement of construction on Pearl Street Commons, a development that will provide much-needed affordable, service-rich housing targeted to veterans and persons with a disability. With strong support from the City and County of McHenry and the Illinois Housing Development Authority, the building is scheduled for completion in winter 2018. 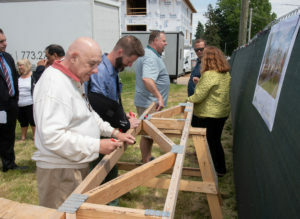 The $7 million development, located at 3512 Pearl Street in downtown McHenry, consists of 25 one- and two-bedroom apartments, all of which are accessible or adaptable, and targeted to veterans and persons with a disability. The building will be Enterprise Green Communities certified and include a library, computer lab, community room, and outdoor recreation amenities. Local service providers TLS Veterans and OTR will provide social services at no charge to the residents. Full Circle Communities is a Chicago-based philanthropic non-profit with the mission of expanding access to affordable housing through preservation and development, thoughtful design, and the provision of significant and contextual services. Full Circle dedicates 75% of their project cash flow to providing services for their residents. 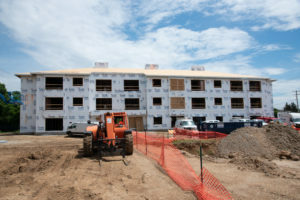 Along with Pearl Street Commons, Full Circle is currently constructing a 36-unit development for families in Chicago’s Brainerd Park Neighborhood, and is in the midst of developing a 36-unit development for veterans and persons with disabilities in Dubuque, IA as well as their first property in the state of Michigan. Yes, all of those will be included. We will let you know when sign-ups are ready. We will probably post application closer to the end of the year. We will be sure to keep you updated when they are posted. Do you have any information as to when the application will be available and if you have to apply to OTR first? I am disabled, financially qualify and a lifelong McHenry resident. Construction is still ongoing, so applications won’t be available until late this year at the very earliest. As for how to apply, you don’t need to apply to OTR first – you will be able to apply directly. The application will be posted on our website and available for you to download and fill out – I can message you again as soon as we post it so you will know. Applications aren’t available yet, but I will let you know as soon as they are. They should be within the next few months. With the two bedrooms do they accept children. Cause I’m a single mother with and five year old boy. Just need to know cause I see you stated fo disable and veteran. Yes, of course, children are welcome! You and your son sound like you’d be a great fit for this community. So I’m on th RHI waiting list and I got a call for a 1 bedroom for this development and I was wondering I can get on the two bedroom. I wouldn’t imagine this would be a problem, but I invite you to call our management office at 847-849-5301 to work out the details. Is this income based ? If so what are the income requirements? ?